Recommendation letter from Salt Lake County Facilities Manager, Bill Opin, in reference to the Draper and Midvale Senior Recreation Center Projects. 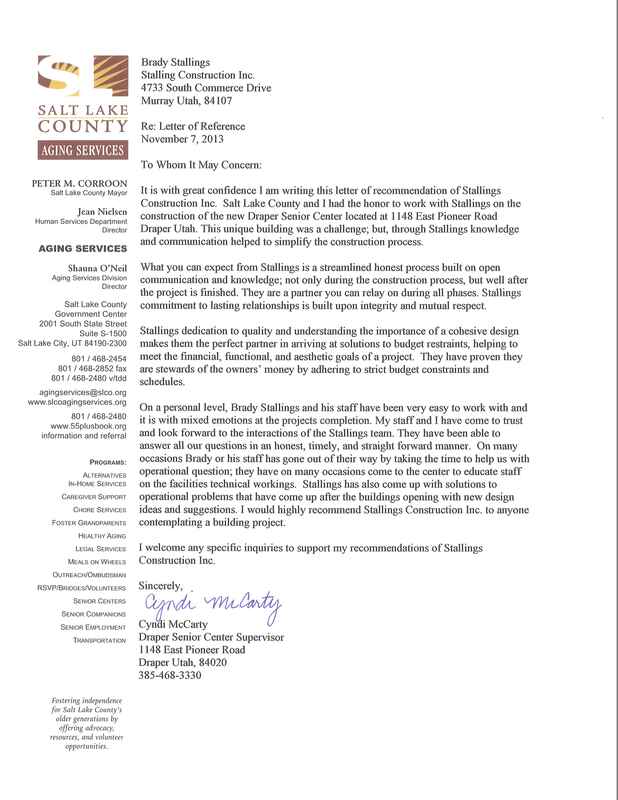 Recommendation letter from Salt Lake County Aging Service after completing the Draper Senior Center. 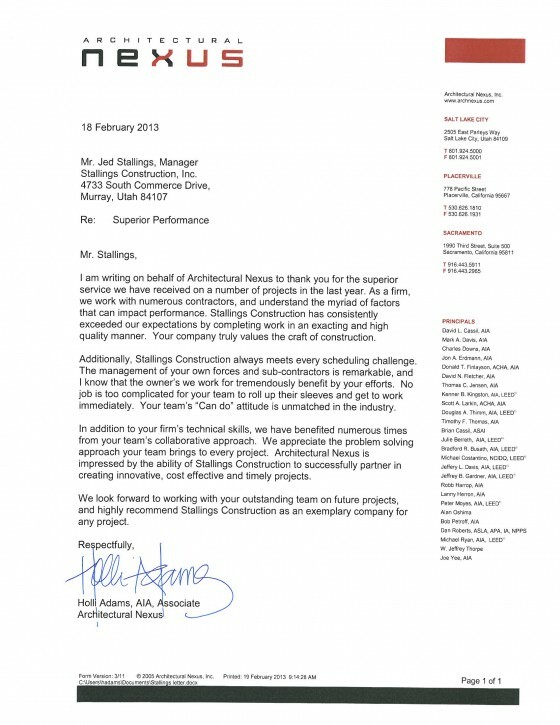 Recommendation letter from the architectural firm Architectural Nexus. 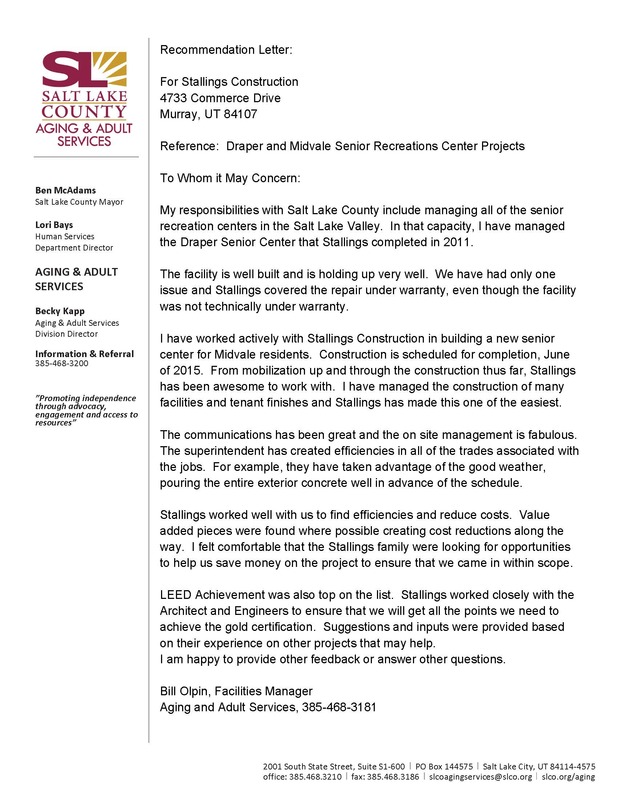 In March 2009, Stallings Construction inc. started their first job with Salt Lake County as the winner of a low bid contract for the renovation and remodel of the abandoned Hillview Elementary school building. The project had a very tight budget and an even tighter schedule for completion with unforeseen conditions being discovered on a weekly or daily basis. Stallings Construction demonstrated their professionalism and exceptional customer care by working through every problem that came up without delaying the overall project and in some cases not impacting the project budget. In July of 2009, Stallings Construction Inc. won the County-wide contract for Small projects due in part to their attention to detail and quality work shown on the Hillview project but more importantly because of their demonstrated ability to provide personal service to the customer’s needs. This contract covers all construction and maintenance type projects under $47,000 in overall construction cost. Since winning the small-cost contract, Stallings Construction Inc. has not disappointed and has lived up to the reputation that they have created for themselves as a quality contractor aptly suited for any size and scope of project from swimming pool renovations to library expansions and everything in between. My experience with Stallings Construction Inc. has been nothing but positive and I would heartily recommend them for any type of construction contract. It is without hesitation that I write a positive letter of recommendation for Stallings Construction. In my 33 years of architectural experience, I have dealt with many contractors. I would place Stallings Construction among the top two contractors for overall performance, owner satisfaction and architect’s scrutiny. Arguably, they could be number one for the following reasons: timeliness, quality, and cost efficiency. Meeting construction schedules says a lot about the management skills of any General Contractor. Not only does Stallings orchestrate the various subcontractors to meet tight schedules, they personally increase their manpower to keep the project moving timely. Their organizing skills, timely delivery of product information and submittals are always complete and ahead of schedule. All projects I have completed with Stallings have completed on schedule. Also, Stallings did not aggressively pursue time extensions or request liquidated damages for delay(s). As an architect, I am most concerned with: 1. The overall quality of construction; 2. Ensuring the owner receives the specified products as well as products installed in a craftsman-like manner, 3. No additional costs to the project (change orders). It is my experience that Stallings Construction employees are team players! They consult the architect with question(s) or clarification(s) pertaining to drawings and then complete installation with excellent craftsmanship; paying attention to detail, with no extra costs to the owner. Stallings Construction’s ability and mode of operation to perform at such a level, is the main reason I place them at the top of my recommended General Contractor’s list. Stallings Construction was the low bidder on the first “Heritage 98” LDS Church meetinghouse plan to be built in the Salt Lake Valley. Without requesting changes to the contract documents which may have jeopardized the construction quality or design intent of the building, they completed the building within the time schedule and budget. Likewise. they were successful low bidders on many other meetinghouses over the years; all without raising the cost of the buildings. Change orders were minimal and only necessary where site conditions varied from the provided survey or the city requested changes. Giving the highest quality of workmanship in a timely manner and within budget is the ideal scenario which any owner or architect could hope for. This has been my experience with Stallings Construction, which has earned my confidence and deserves my utmost favorable recommendation as general contractor.